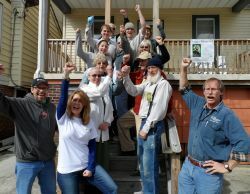 In the spring of 2009, we gathered as a group for the first time to form the Fuller Center for Housing in the New Jersey Pines, the first Fuller Center covenant partner in the state of New Jersey. In one way of another each of us has led or served our churches through mission trips devoted to disaster recovery, building, repairing and restoring homes for those who have suffered losses. So moved by the story and journey of the Fullers and The Fuller Center for Housing, we have joined to continue the purpose of providing decent housing for people in the southern New Jersey area. Now, we are busy helping residents recover from Superstorm Sandy. We recently worked on 21 homes during the 2013 Millard Fuller Legacy Build in Atlantic City and we are now focusing on storm damaged homes in Atlantic and Ocean County. The Cleanup Continues A Year and A Half After Super Storm Sandy. Fuller Center’s work in spotlight on 1-year anniversary of Sandy. TV/Newspaper coverage of continuing Sandy recovery efforts. Complete coverage of the 2013 Millard Fuller Legacy Build with stories, photos and video. Atlantic City residents won’t be forgotten in wake of Sandy. Hurricane Sandy recovery efforts under way in New Jersey. New Jersey to host 2013 Millard Fuller Legacy Build. Clemson spring-breakers work with Fuller Center in New Jersey.